Langila volcano Volcanic Ash Advisory: VA OBS TO FL100 MOV ESE AT 11/1250Z. Strong ash explosions of vulcanian type were recorded from crater 2 during 20-24 September 2009. Plumes rose 2,000-3,000 m above the crater rim. Lightning could be observed in the ash column at night. A deep magnitude 5.3 earthquake occurred near Langila in on 5 October, but is unrelated to volcanic activity. After a gradual increase throughout December 1982, violent activity including vulcanian explosions producing ash columns reaching several kilometers height were frequent at Langila volcano in 1983. Particularly strong eruptions on 11-14 and 22-24 January ejected incandescent lava bombs on the volcano's flanks and ignited vegetation. Activity between 3-11 February consisted in frequent explosions producing ash columns rising 3-4 km. During peak activity between 11-16 February Crater 2 produced continuous strombolian eruptions 100 m high and intermittent powerful Vulcanian explosions. Activity decreased but continued at steady levels. The largest event in the next months was a vulcanian explosion on 18 April 1983 which formed a 8 km ash column which was observed from a plane in 70 km distance. An explosion on 26 April produced a 5 km ash column. 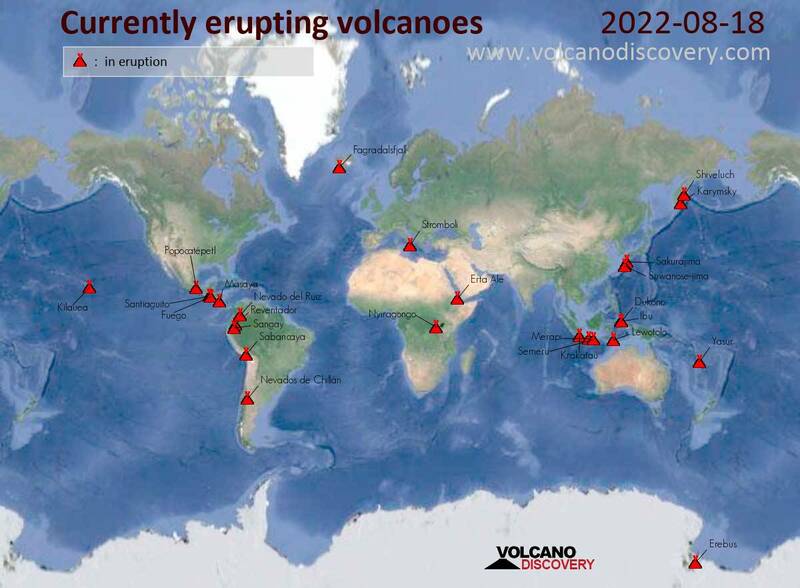 Vulcanian eruptions increased again in June. Up to around 30 vulcanian explosions were reported on 7 June. Activity remained high in July and early August, when occasional "very powerful" vulcanian explosions took place, then decreased towards the end of August. In contrast to the activity earlier in the year, the explosions in August were normally not accompanied by visible ejection of incandescent lava. Moderate activity prevailed in September-November. Vulcanian explosions accompanied by loud detonation sounds and ejections of incandescent material were reported on 24 and 27 October. Between 1-20 December, activity at Langila volcano was low and consisted of white-grey steam and ash emissions rising 0.6-1.2 km above the summit, accompanied by weak to low rumbling explosion noises. Glow from the crater was visible again 12-14 December, and glowing fragments were ejected to 270 m on 13 Dec. Fine ash fell in up to 10 km distance to the north of the volcano on 6, 7, 11, and 15 December. The activity was accompanied by the formation a small lava flow on the NE flank of crater 2 at the end of December. Craters 2 and 3 were very active in January and February 1982, producing strombolian and vulcanian eruptions, and a lava flow from crater 3 towards the end of January. Strong Strombolian activity and a lava flow occurred from crater 2 in May. Activity decreased in summer and gradually picked up after August. 2 large Vulcanian explosions were observed from Crater 2 on 12 and 22 November. A new crater was formed on the flank of Crater 3 on 19 January. Thick brown ash emissions and incandescence were observed throughout the month. Crater 3 produced a lava flow of 700 m length, which must have had started sometime between 28 Jan and 15 Feb. The lava flow was emitted from the new vent formed on 19 January. The effusive & explosive activity continued during May and June. Strombolian and vulcanian explosions ejected glowing bombs to up to around 600 m, accompanied by almost continuous "roaring, rumbling and detonations" audible in up to 10 km distance. A larger explosion on 9 May produced a small base surge which traveled about 300 m W and left a pale brown deposit. Activity decreased after June and picked up in October. Vulcanian explosions occurred from crater 2 at intervals of several minutes or more and produced ash columns reaching 3-5 km height in late October. Crater 3 had strombolian activity with ejections to up to 300 m height. A block lava flow issued from crater 3 and reached 3 km distance. Frequent ash eruptions were observed in January, and areal surveys discovered that the new lava dome had reached the height of the crater rim but not overflown. Activity was moderate to low during the rest of the year. 10 large explosions happened on 27 September, producing ash fall reaching several millimeters at the Kilenge mission station in 10 km distance NW of Langila volcano. Mild strombolian activity and small intra-crater lava flows occurred inside crater 2 in 1977, in particular in September. This activity had ceased by mid December. Strombolian activity re-started in late April 1978. This activity changed to vulcanian by the end of May, when crater produced 1-2 strong explosions per day. After a decrease in June or July, activity intensified in October again, when there were few, but more powerful than usual explosions. An new active lava dome was first discovered in Crater 2 on 7 December. It produced a night glow visible from 10 km distance. An unusually large explosion was reported from Langila on 15 February 1974. It caused extensive changes to the shape of crater 2. An overflight showed continuous ash emissions from crater 2 and small eruptions from crater 3. A new eruption of Langila volcano began on 12 July 1973 and lasted about 6 months into early 1974. It produced a slow, steady lava flow from crater 3. The flow had reached 1 km length and was 300 m wide when observed on 18 July. According to the Rabaul Volcano Observatory, this was only the third lava flow at Langila in the 20th century, the other being in 1960 and 1967.